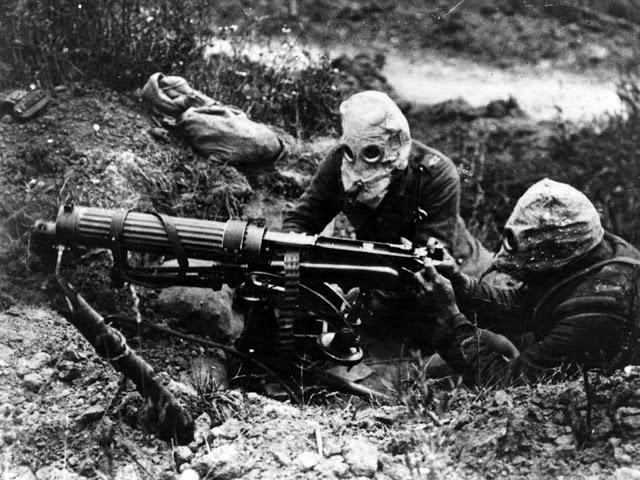 Fought between July 1 and November 1, 1916 near the Somme River in France, the Somme Offensive was one of the largest battles of the First World War. During and after the Somme, the British army started a real improvement in military tactics. Also, the French attacked at the Somme and achieved greater advances on July 1 than the British did, with far fewer casualties. But it is the losses that are most remembered, especially on the first day of the Somme offensive on July 1, 1916. The 57,470 British casualties were greater than the total combined British casualties in the Crimean, Boer, and Korean wars. In contrast, the French, with fewer divisions, suffered only around 2,000 casualties. 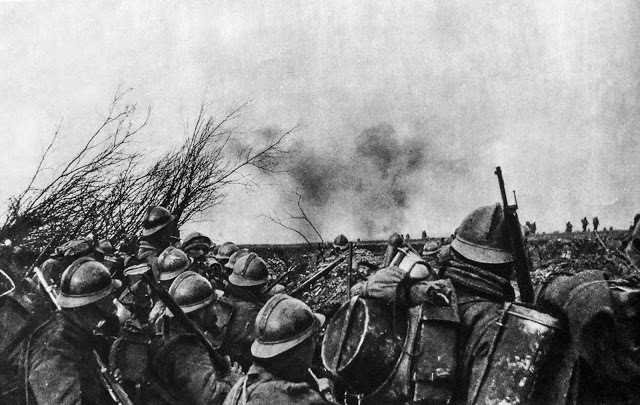 By the time the offensive ended in November, the British had suffered around 420,000 casualties, and the French about 200,000. German casualty numbers are controversial, but may be about 465,000. In 1916, the French proposed a joint Franco-British offensive. The British army assumed the major role of the Somme offensive, attacking the north side of the Somme with fourteen infantry divisions. The French attacked astride and south of the Somme with five divisions. In defense, the German army deployed seven divisions. The British attack was planned by Douglas Haig and Henry Rawlinson, GOC Fourth Army. The two differed about their offensive tactics and the length of the bombardment. They ended up adopting a plan that was an awkward mixture. The artillery was the key to the offensive, but it did not have the ability to cut all the wire, destroy deep German trenches, knock out all enemy guns, or provide a useful barrage for the infantry attack. At zero hour on July 1, the artillery shifted away from the German front trenches too quickly and left the infantry exposed. But the French, with Verdun experience, had much more heavy artillery and attacked in rushes, capturing more ground and suffering less. After July 1, a long stalemate settled in, with the German army digging defenses faster than Allied attacks could take place. 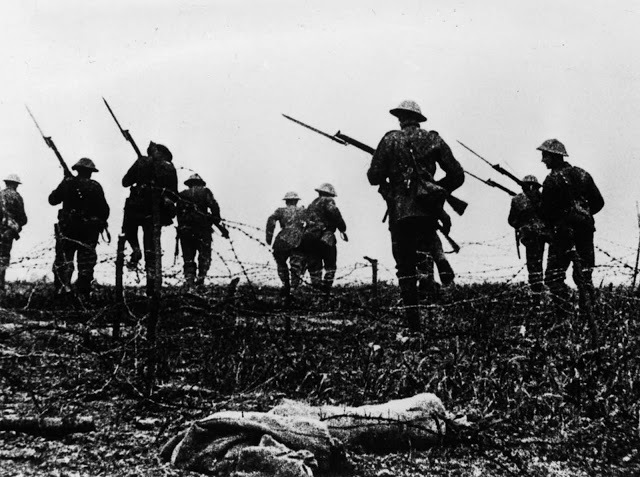 Despite small advances, the Somme became a bloody battle of attrition. Haig has been criticized for prolonging the campaign into winter, especially for the last six weeks. 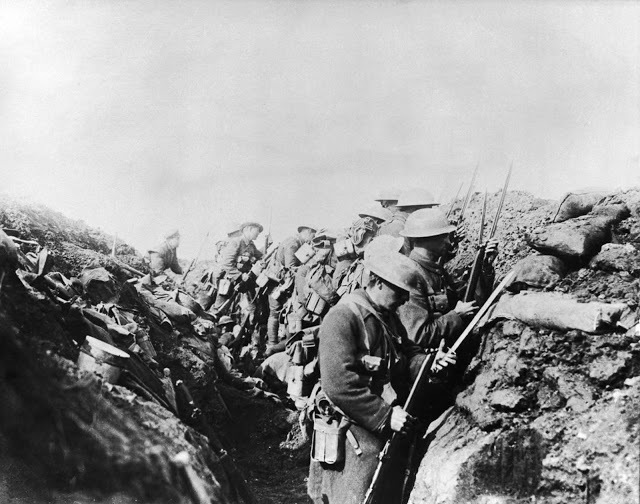 The Somme was an expensive lesson in how not to mount effective attacks, but the German army was also weakened and in February retreated to new, and shorter, defensive lines. 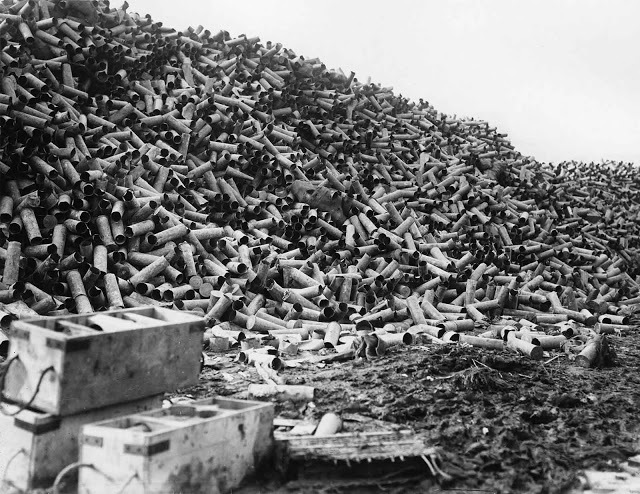 In the week leading up to the battle, over 1.5 million shells were fired. French troops prepare to move on German positions. 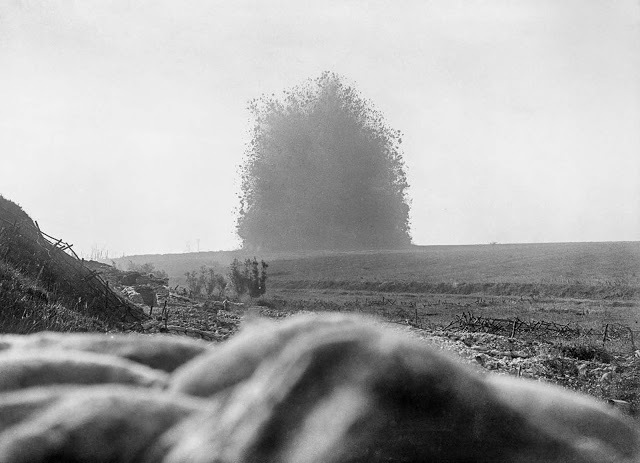 A 45,000-pound mine (2 ton) under the German front line positions at Hawthorn Redoubt is fired 10 minutes before the assault at Beaumont Hamel on the first day of the Battle of the Somme. The mine left a crater 130 feet (40 m) across and 58 feet (18 m) deep. July 1, 1916. British troops go “over the top” in a scene staged for a newsreel film on the battle. 1916. 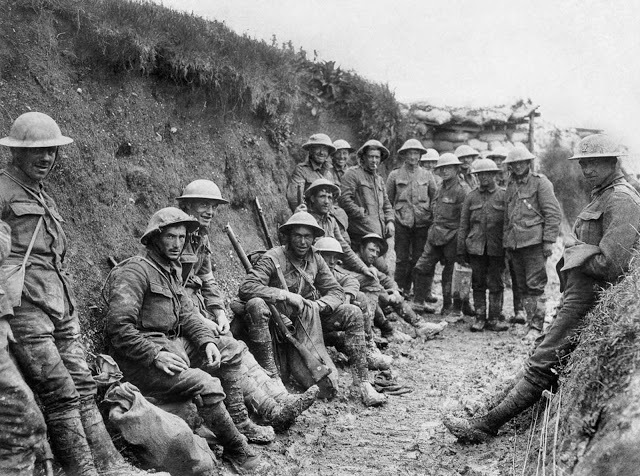 Men of the Royal Irish Rifles rest during the opening hours of the Battle of the Somme. July 1, 1916. 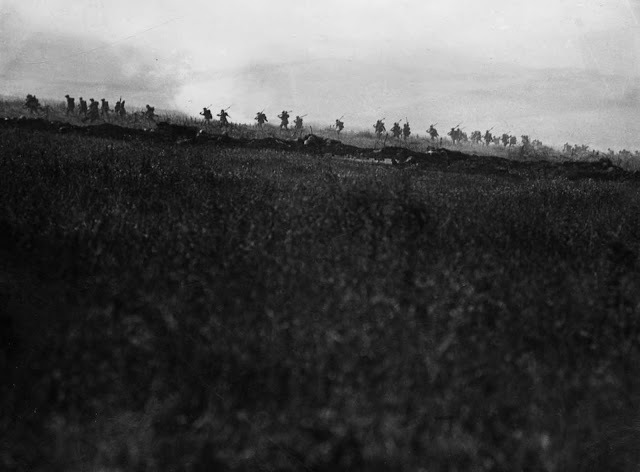 British 34th Division troops advance on the first day of the battle. 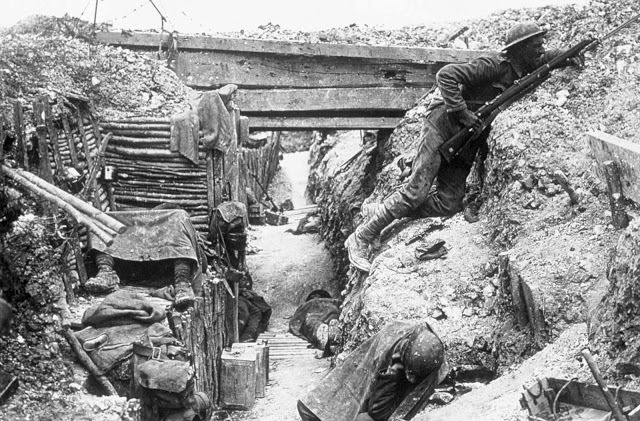 The British trenches, manned by the 11th battalion, The Cheshire Regiment, near La Boisselle. 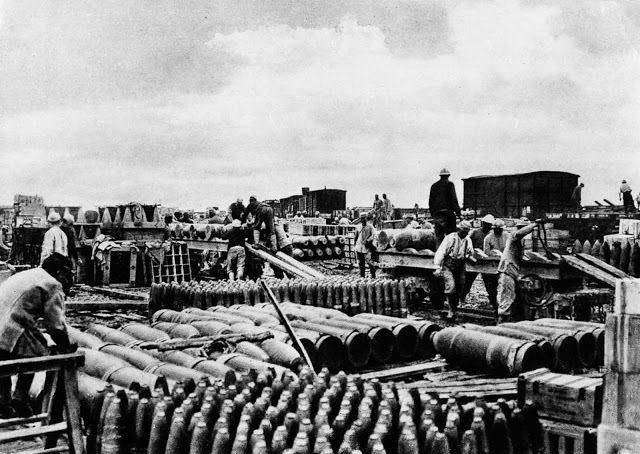 An artillery depot behind German lines. 1916. 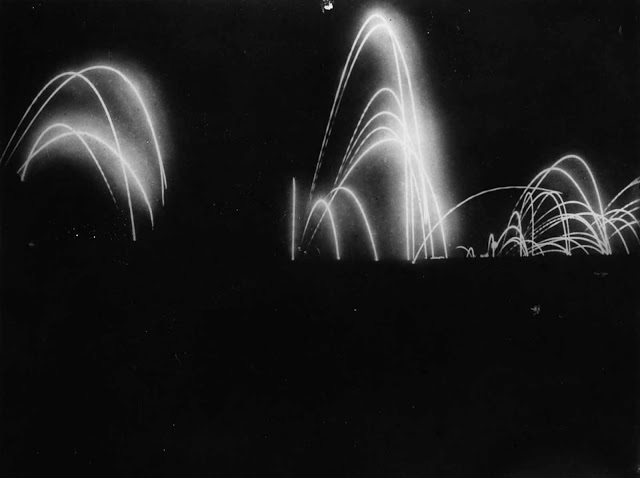 Artillery barrages light up the sky during the attack on Beaumont Hamel. July 2, 1916. 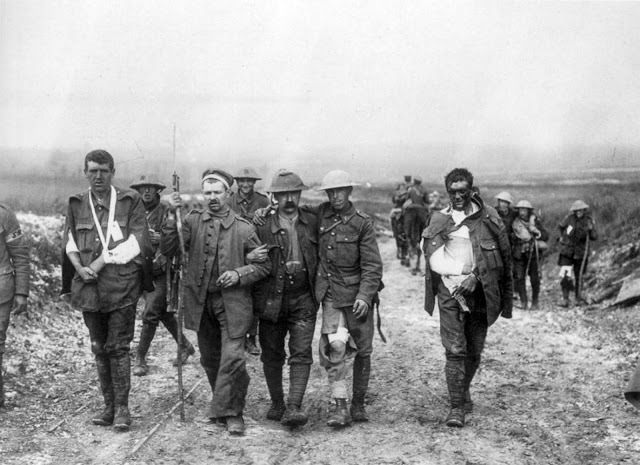 Wounded British soldiers return from the front lines. 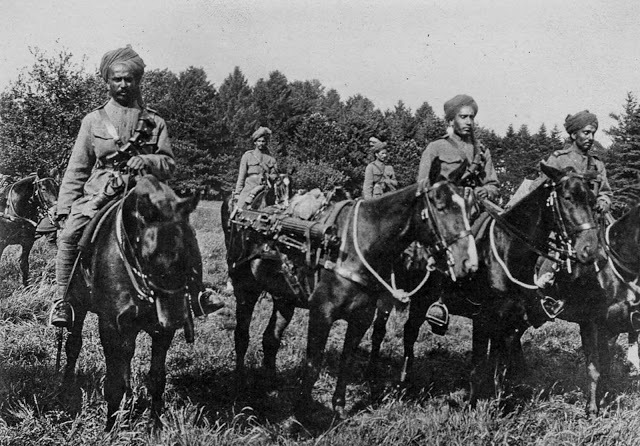 Indian cavalry of the British army. 1916. 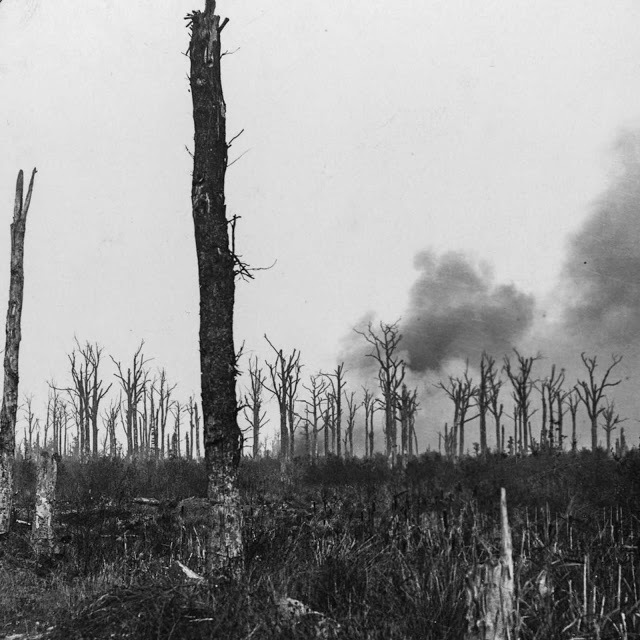 Mametz Wood was the objective of the 38th (Welsh) Division at the Battle of the Somme. The division took 4,000 casualties capturing the wood. 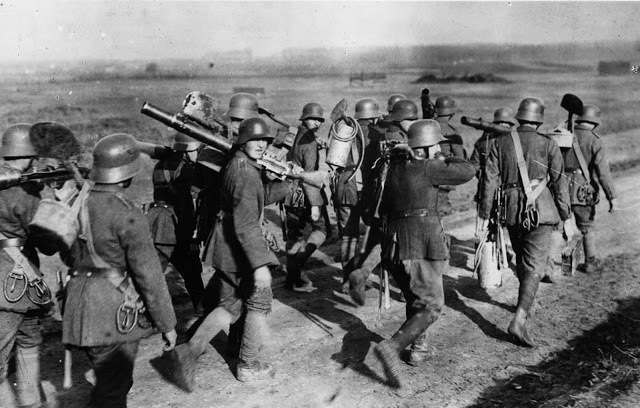 German troops carry Lewis gun equipment. 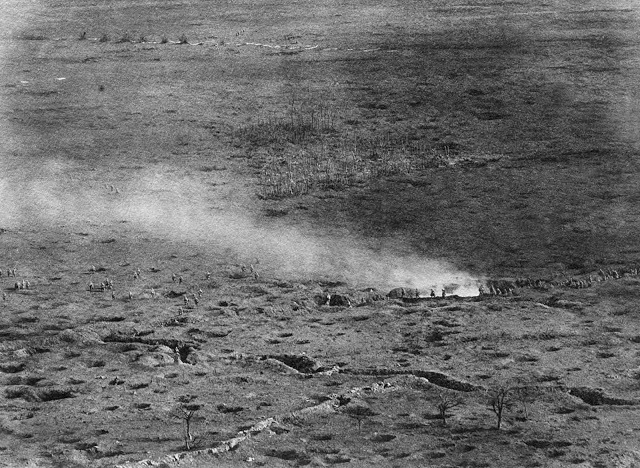 An aerial view of a French offensive. 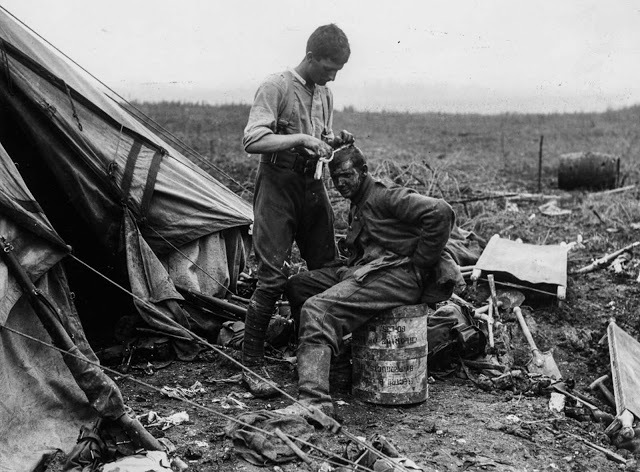 A British soldier dresses the wounds of a German prisoner near Bernafay Wood. July 19, 1916. 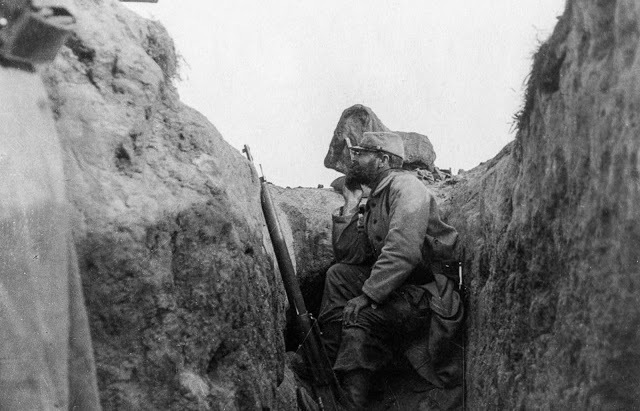 A French soldier peers over the edge of a trench. Canadian troops fix bayonets before going over the top to assault German positions. 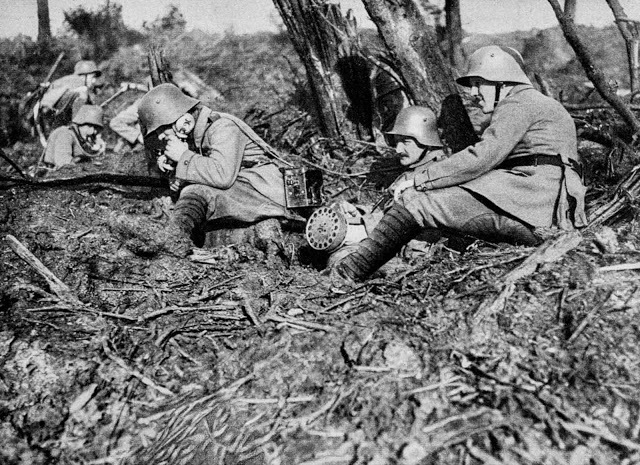 A German field telephonist relays artillery requests from the front lines. 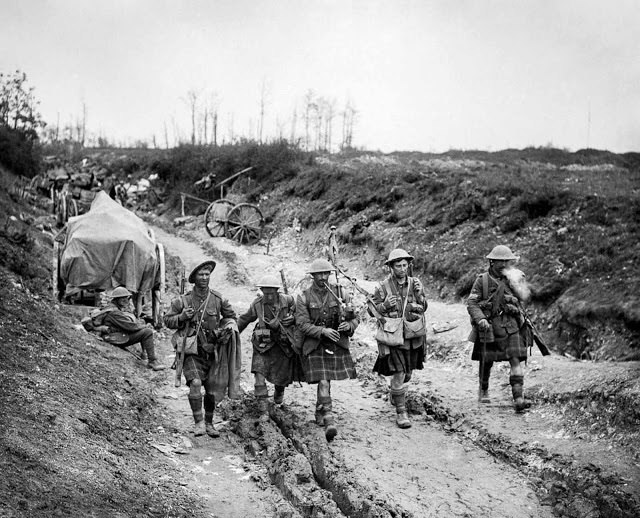 A piper of the 7th Seaforth Highlanders leads four men of the 26th Brigade back from the trenches after the attack on Longueval. July 14, 1916. 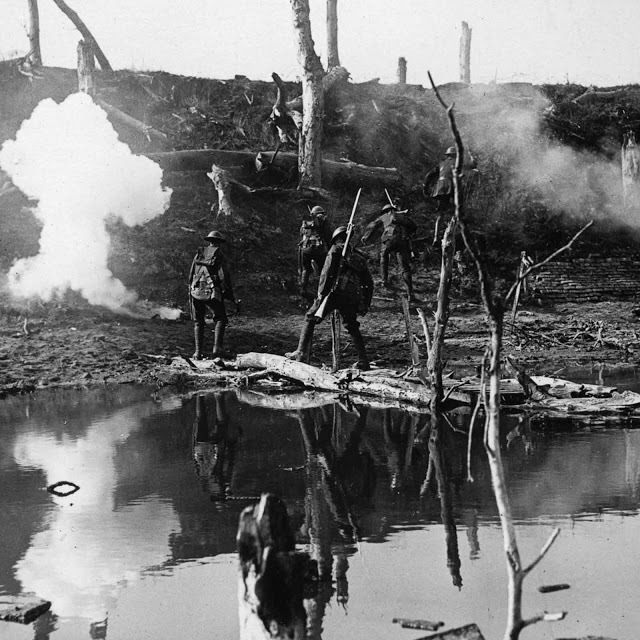 Soldiers cross the river Ancre during the Allied attack on Thiepval Ridge. September, 1916. 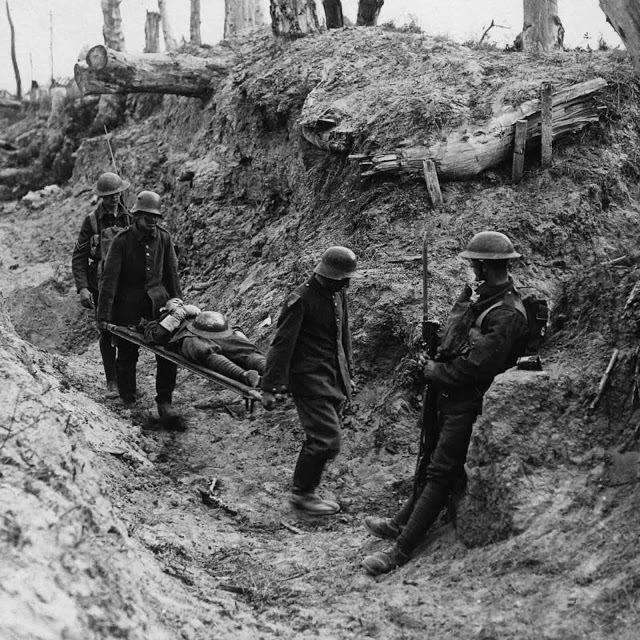 German prisoners carry British wounded during the assault on Trones Wood. 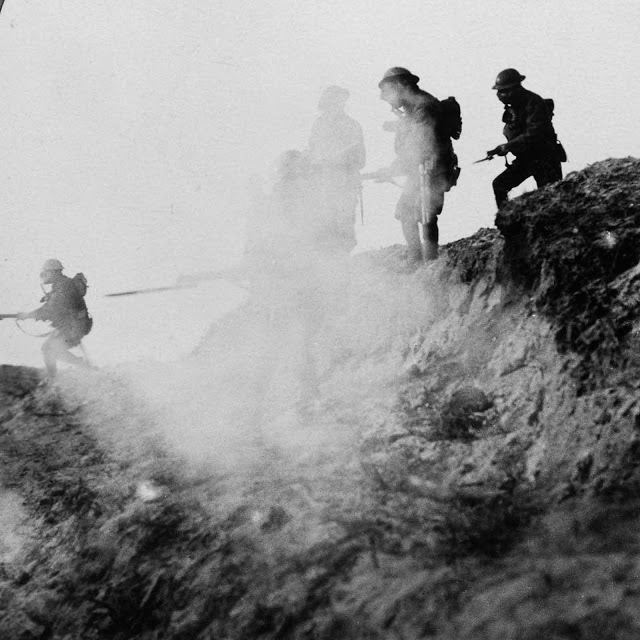 British soldiers advancing under cover of gas and smoke while making a break in the German lines through to Serre and Thiepval. September, 1916. 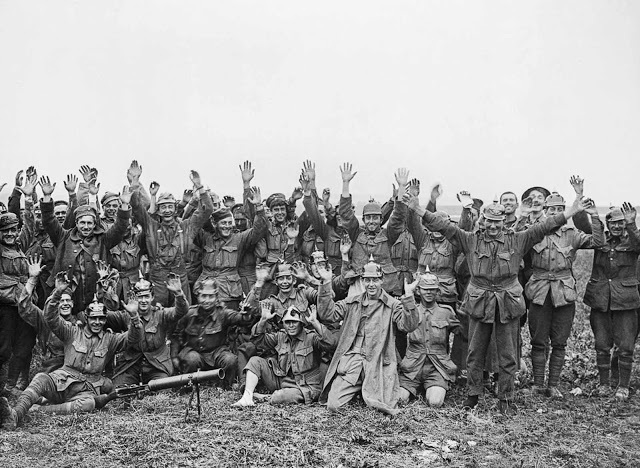 Men of the 1st Anzac Division, some wearing German helmets, pose for the camera after fighting near Pozieres Ridge. July 23, 1916. 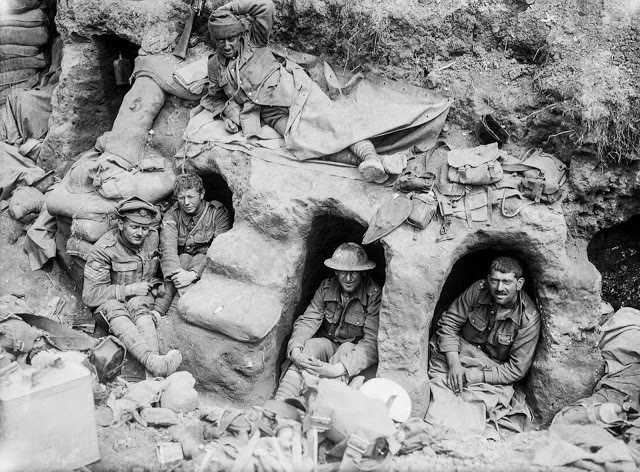 Men of the Border Regiment rest in shallow dugouts near Thiepval Wood. August, 1916. 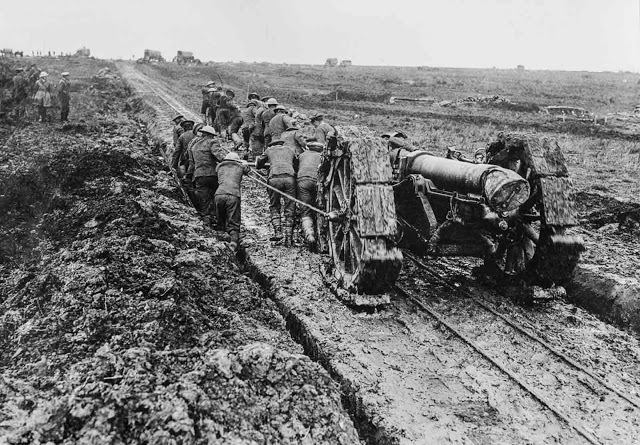 6-inch howitzer is hauled through the mud near Pozieres. September, 1916. 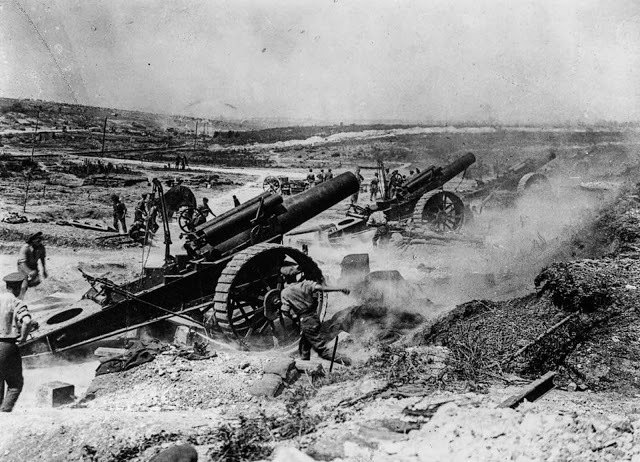 39th Siege Battery artillery in action in the Fricourt-Mametz Valley. August, 1916. 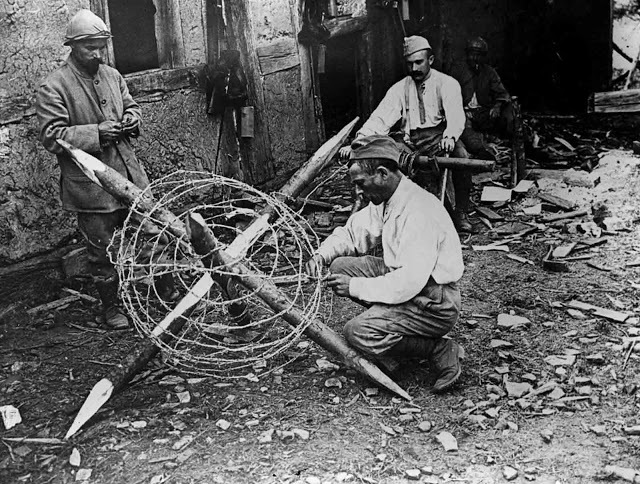 A man builds barbed wire obstacles on the Somme. September, 1916. 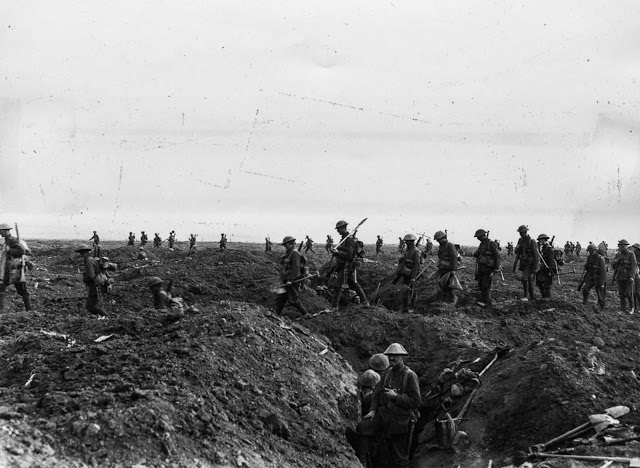 Reinforcements cross the old German front line during the advance towards Flers. September 15, 1916. 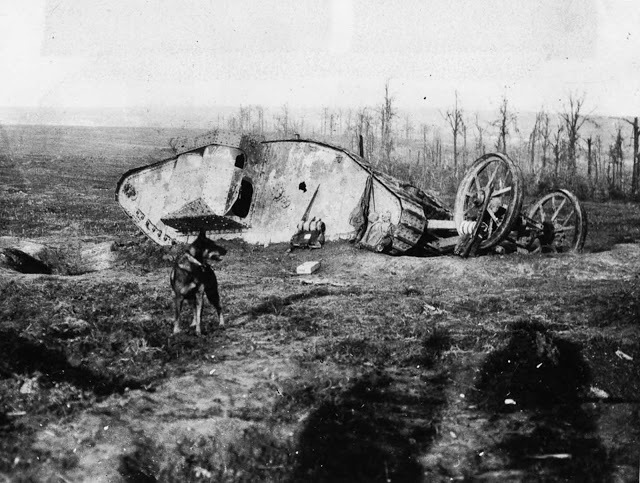 Mark I tank lies ditched north of Bouleaux Wood on the day tanks first went into action. 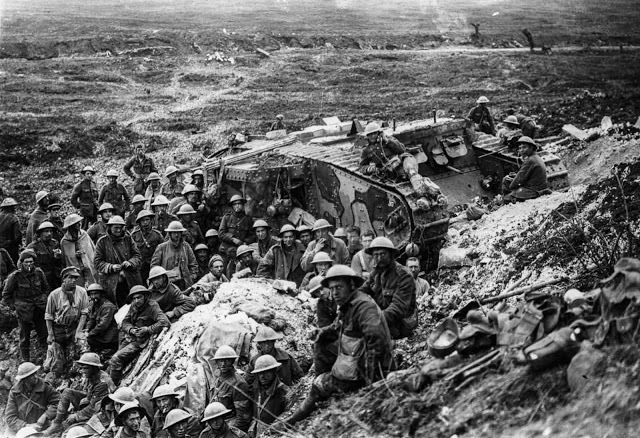 Soldiers gather near a Mark I tank at Flers. September 17, 1916. 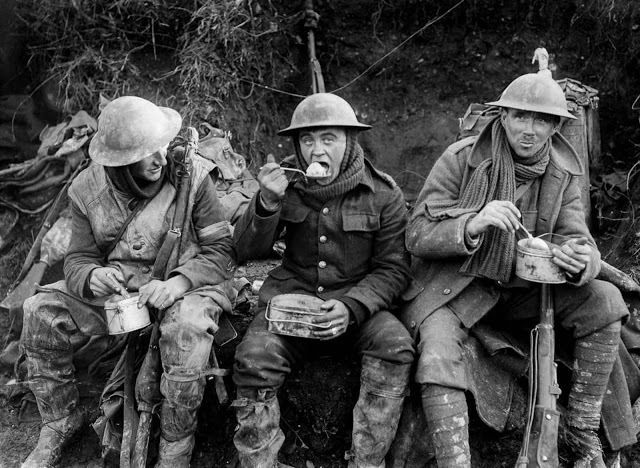 British soldiers eat hot rations in the Ancre Valley. October, 1916. 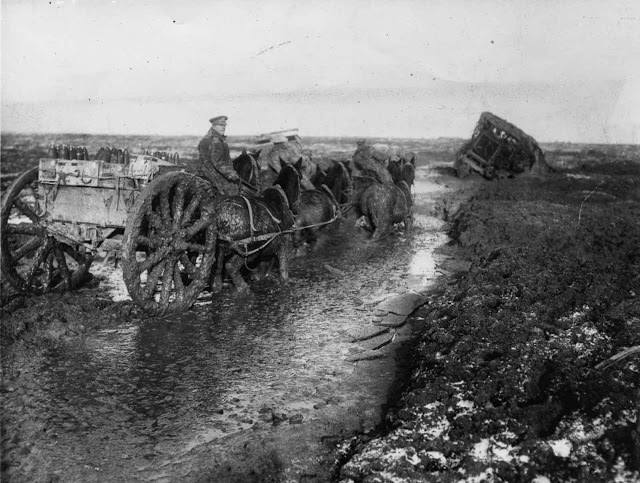 Horses haul ammunition forward in deep mud along the Lesboeufs Road outside Flers. November, 1916. 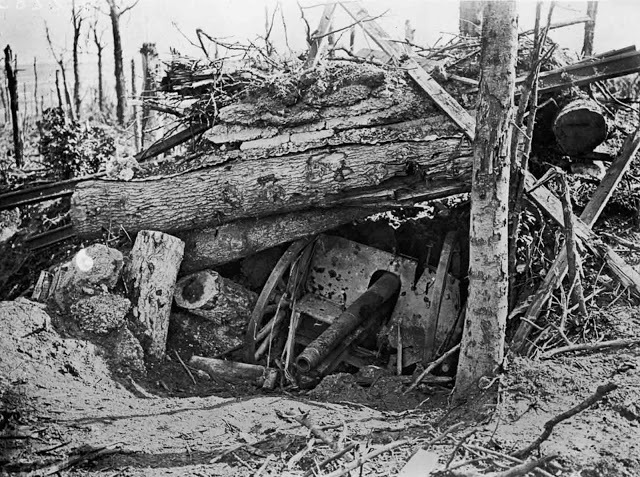 German cannon lies buried under uprooted trees in Louage Wood during an Allied offensive. October 10, 1916. 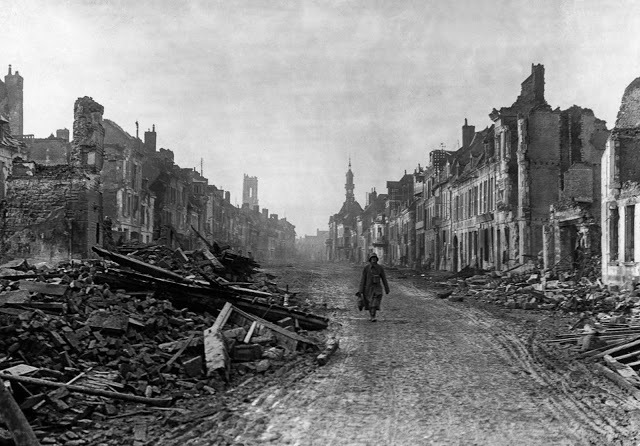 German soldier walks through the ruined streets of Peronne. November, 1916. 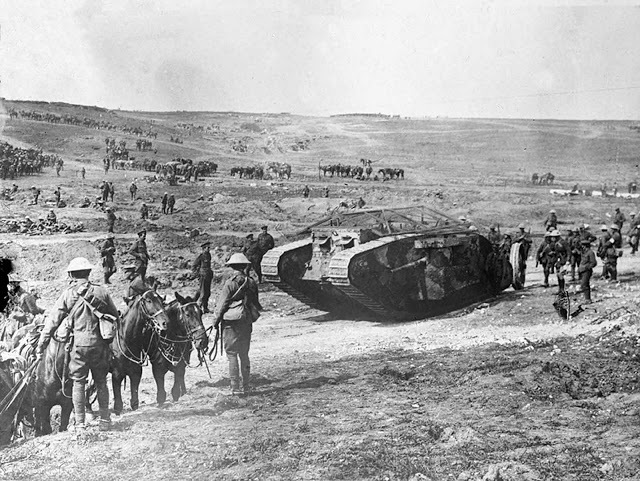 By mid-September the British were ready to assault the German third line of defences with a new weapon, the tank. 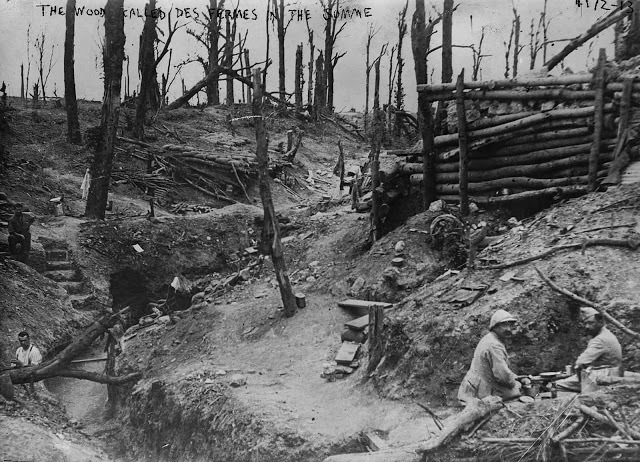 Soldiers sit in the trenches of the wood called Des Fermes in the Somme.